Structured. Simplicity is convincing. The mainstream 15.6" all-rounder goes without aluminum and high-gloss (mostly). The non-slip surfaces are pleasant, but they are no good for boasting. We'll clarify which office and multimedia qualities the 5552G has. Acer's 5552G series supplies simply structured all-rounders and multimedia systems for little money. The maximum of performance is given by four cores (Phenom II X4 N950) beside ATI's Mobility Radeon HD 5650 in the version N954G50Mnkk (LX.R4302.072). We, however, have also spotted a version of our test device without dedicated graphics (P324G32Mnkk, LX.R4402.087). We've invited the inexpensive configuration of Athlon II P340 (2 x 2.20 GHz) and ATI HD 5470 to our office. Potential notebook buyers get office suitable computing performance with a bit of gaming ability (for older games) starting at 579 euro. 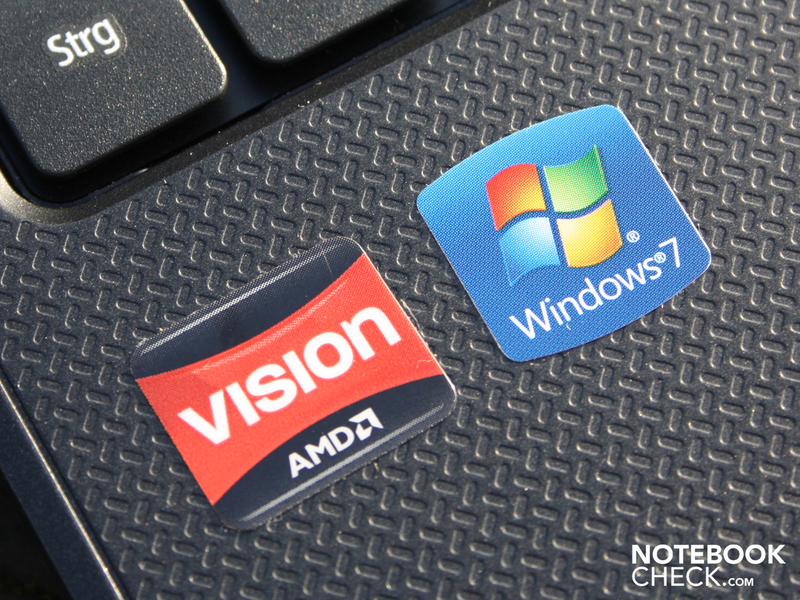 Find out how much performance you can expect of the AMD processor in this review. What do the battery life and workmanship look like? Is the keyboard feasible to type the dissertation? All answers can be found in our detailed review. 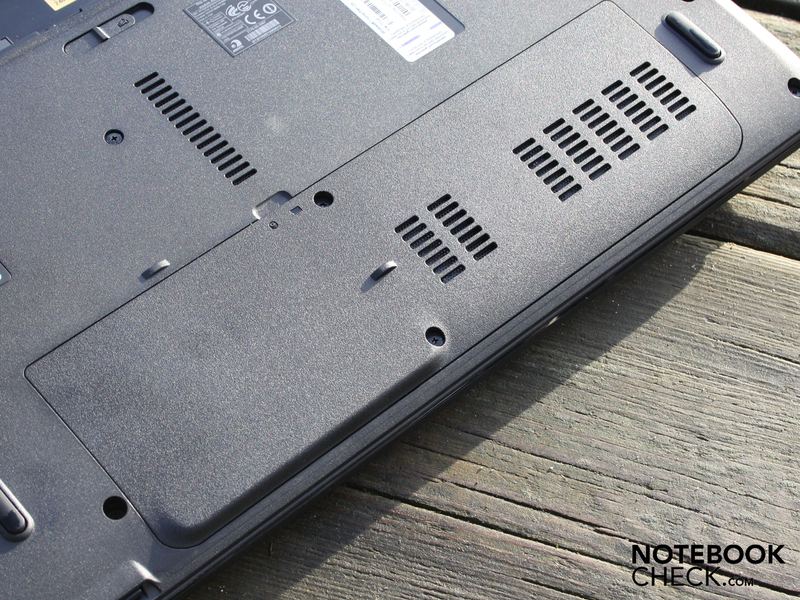 The Aspire 5552G's case is just as suitable for mobile use as for a serious workplace or for the student quarters. Our hands are spoiled by a pleasantly matt and structured texture on the work surface. Fingerprints haven't got a chance. They only find a retreat on the black, glossy display bezel. The case is sufficiently stable and makes a long-lasting impression with clean gaps. We can only twist the base unit to a certain extent with both hands. The wrist-rest can be dented marginally on the right. The key bed yields obviously under light pressure, though. The base plate can be depressed selectively with a finger - in particular at the vent. 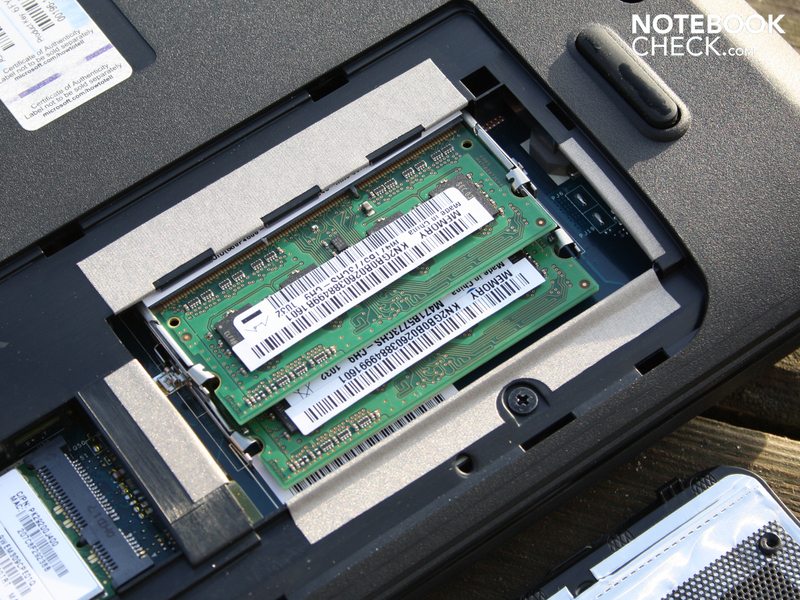 The large opening on the bottom provides upgrade possibilities: You have access to the hard disk, RAM and WLAN module (mini PCIe). We can twist the lid evidently. However, its rigid surface and the grip convey a solid impression. 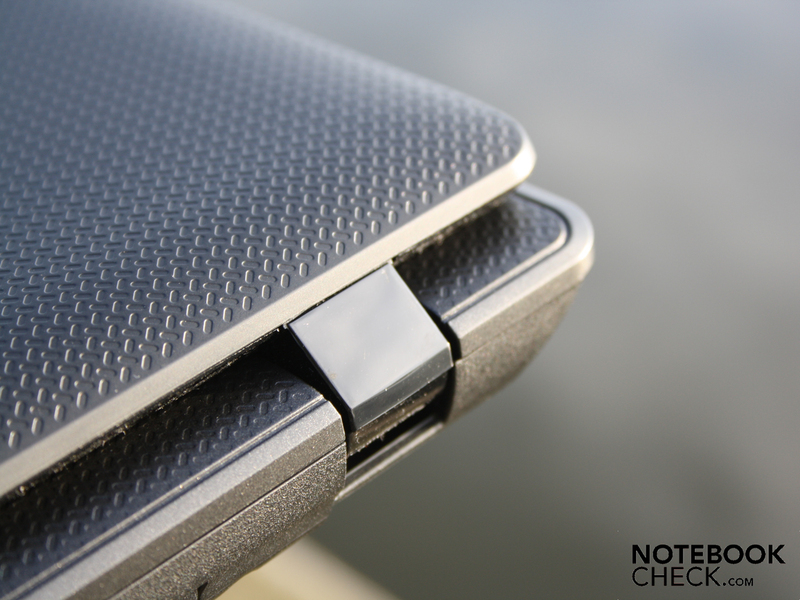 The non-slip structure also provides a very good everyday suitability without a notebook case. 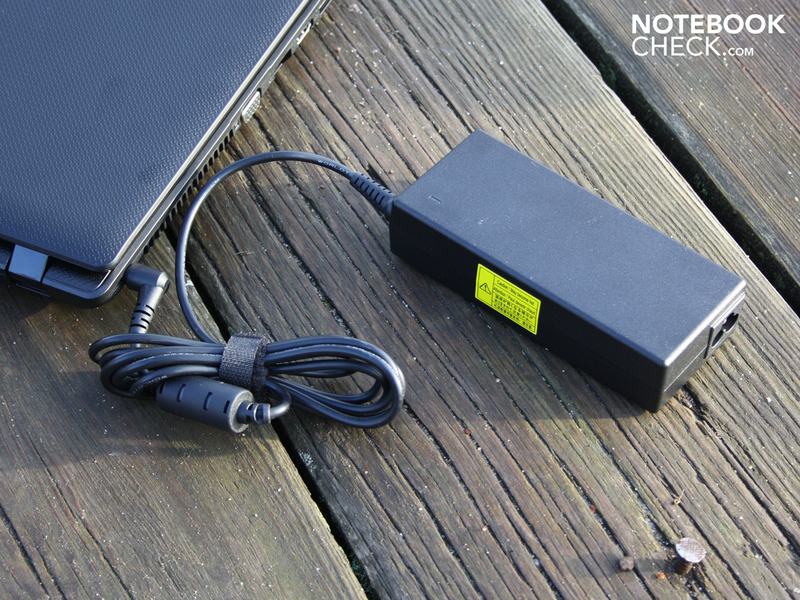 The battery can be removed for permanent desktop use. No gap in the work environment is created and the battery pack doesn't have any feet. The hinges keep the lid securely in place and it hardly teeters. They are fastened tightly so that we need both hands to open the lid. The hinges sit securely in their latch on the case. The maximum opening angle is fully sufficient for a use on the lap. The angle is a wide 160 degrees. 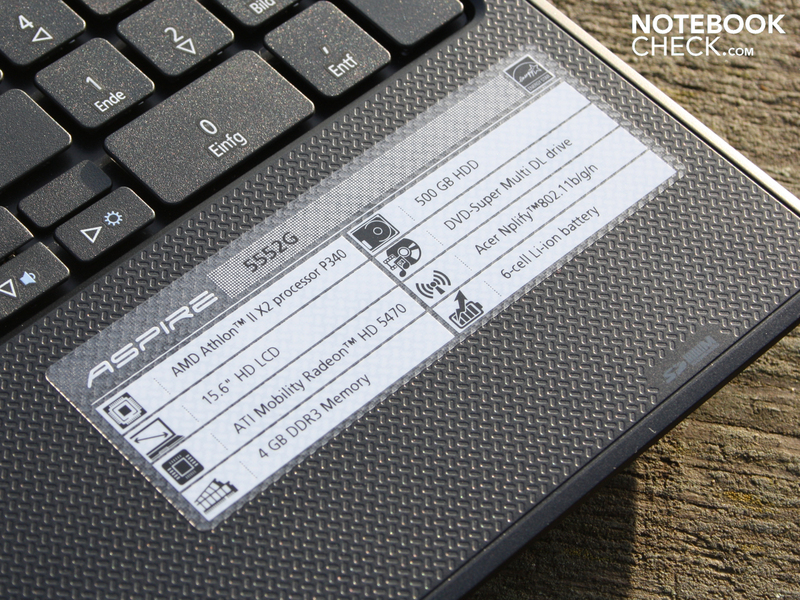 The Aspire 5552G only supplies a limited amount of interfaces for connecting peripherals, like printer, router, mouse or hard disk. eSATA (fast external HDDs), ExpressCard (controller cards, etc.) or FireWire (camcorder, external HDDs) don't belong to the array. External flat screens or even TV sets can be connected to the HDMI. There are only three USB ports. 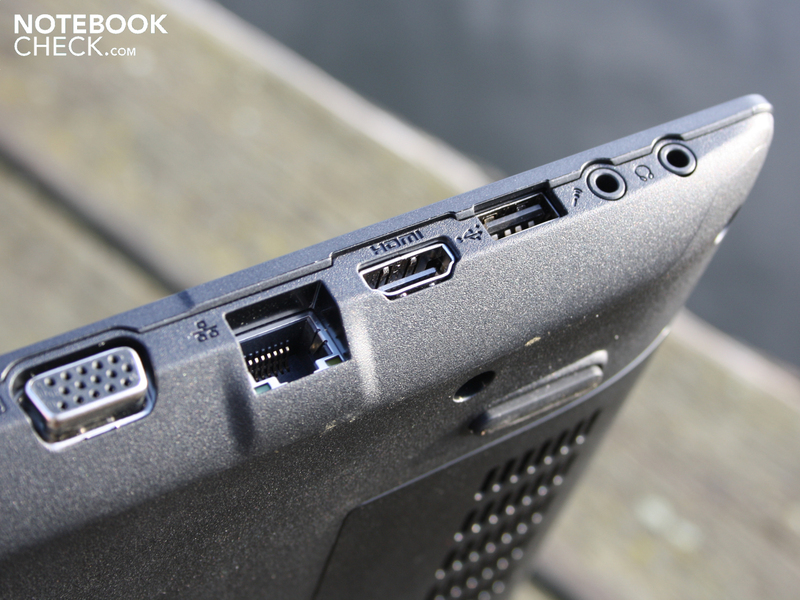 The right and left ports' positioning doesn't make much sense. 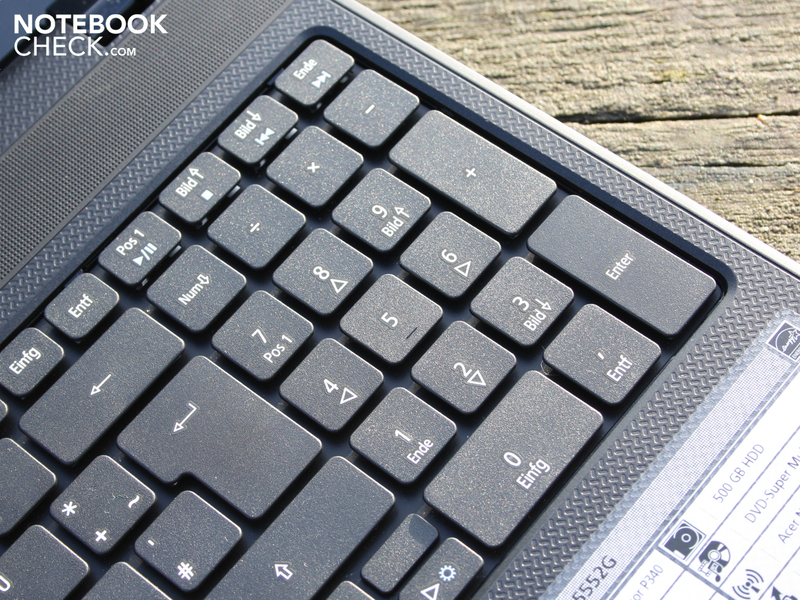 Righties and lefties could be at an equal disadvantage when using a mouse with the notebook. USB cables, as well as HDMI / VGA impair mouse use. Interfaces on the rear or at least in the notebook's back lateral areas would have made more sense. 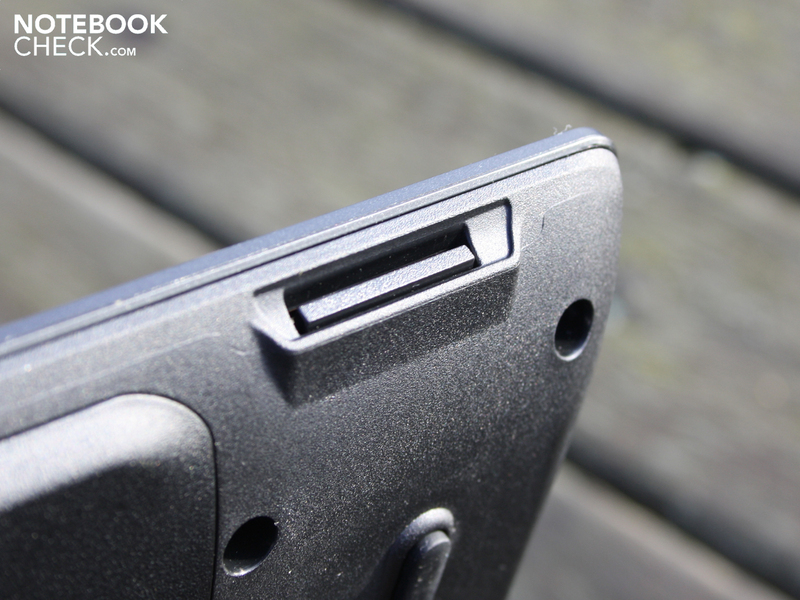 As so often, the sunken hinge prevents port placement on the rear. Thus, all sockets, including the DC-in, are compiled on the visible sides. The Atheros AR5B97 wireless card supports WLAN in the fastest draft-n standard. It also contains the integrated Bluetooth 3.0 module. 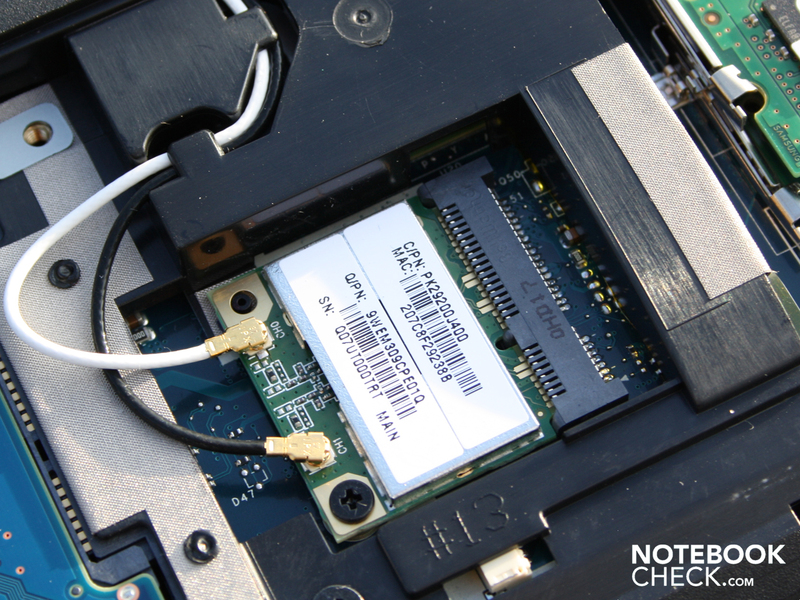 If you want to connect the 15.6 incher with the gigabit switch at home, you will find the matching LAN card in the Broadcom NetLink Gigabit Ethernet Adapter. The 5552G is state-of-the-art in terms of network technology. 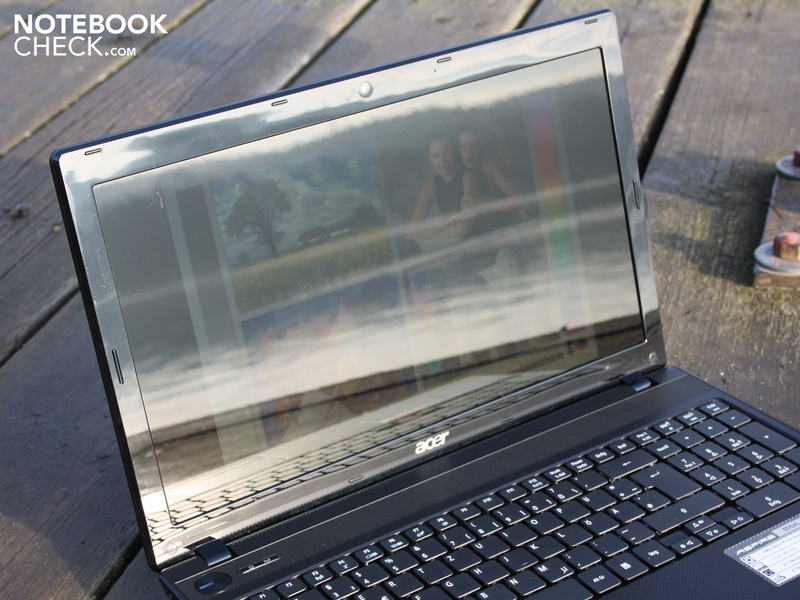 The user has to create his own recovery data carriers for Windows via Acer's Recovery Manager. The desktop isn't crowded by preinstalled software and links (Acer GameZone, Accessory Shop, registration, updater). The perpetual reminder of Norton Internet Security and registration gets annoying after a while. HP notebooks prove that this isn't necessary. Such killjoys can be unselected during the initial start. The warranty is a 24 month pickup and return service. The two years are made up of 1 year product warranty plus a 1 year Advantage warranty extension. No registration procedure is necessary to attain the latter. Almost 90 euro has to be invested for Acer's Advantage warranty extension for a warranty period of 3 years. However, you buy an onsite service for the entire period that isn't included in the standard warranty. The keys bid a clear pressure point and sufficient key stroke. Depending on the positioning, the key stroke is spongy though (right & left) or firm (center). The keys yield palpably on the right and left and thus supply a very pliable typing feel. 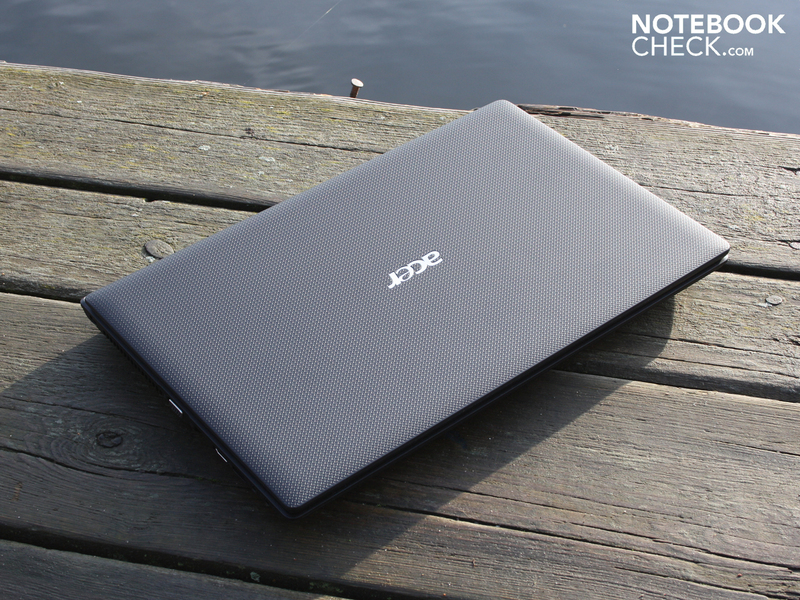 Acer installs a complete number pad and thus emphasizes the office notebook claim. The number pad simplifies entering numbers. The arrow keys are only half the size of standard letter keys, but at least a gap separates them from the shift key. That makes touch-typing a lot easier. 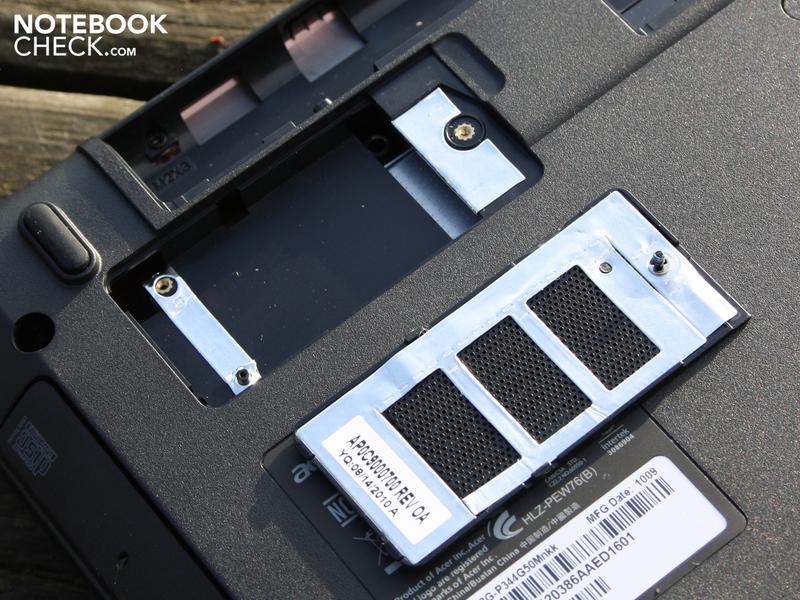 The mouse replacement is a Synaptics multi-touchpad (V7.2). It surface is smooth and can be used pleasantly accurate and fast. The touch surface doesn't have a marked horizontal scroll bar, but it has a visibly marked vertical scroll field. The lower scroll area can be enabled in the Synaptic software, though. 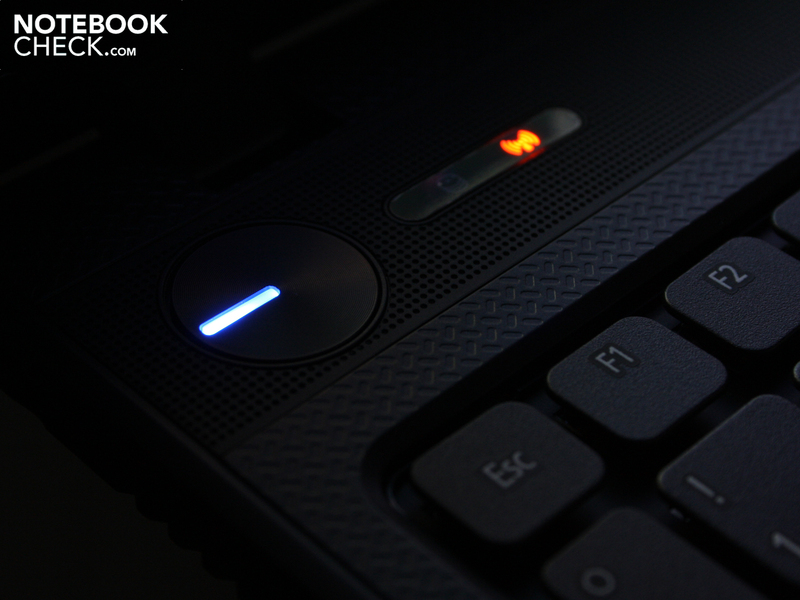 The keys click fairly loud, the pressure point doesn't need too much force and they supply a good feedback. 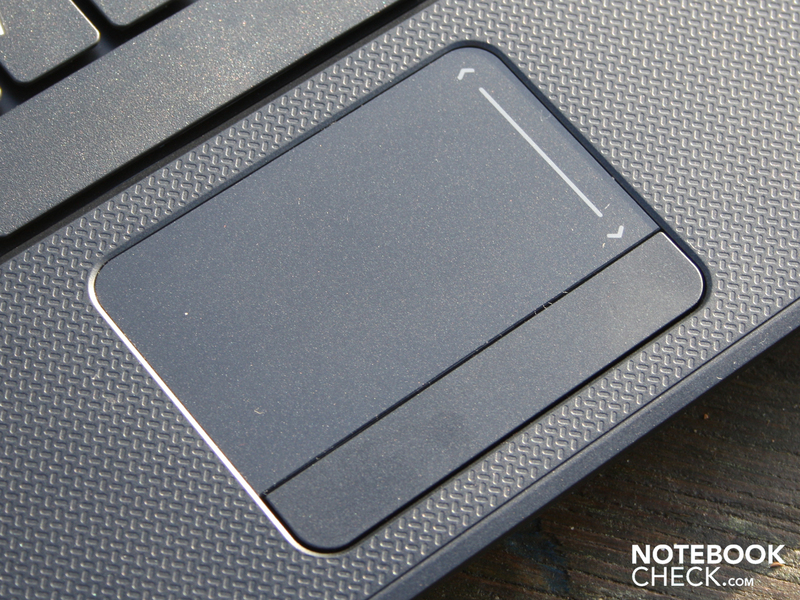 Overall, the pad that is sensitive to its edges makes a usable impression. But the feedback is too weak for a perfect office mouse pad. The reflective LG Philips screen (model: LP156WH1-TLC1) has a resolution of 1366x768 pixels. The WXGA resolution is acceptable for a 15.6 incher. The pixel distribution comes very close to an aspect ratio of 16:9. The LG Philips screen is weak in every way. However, it's unfortunately standard for the office and multimedia category. It starts with a low contrast of 138:1. 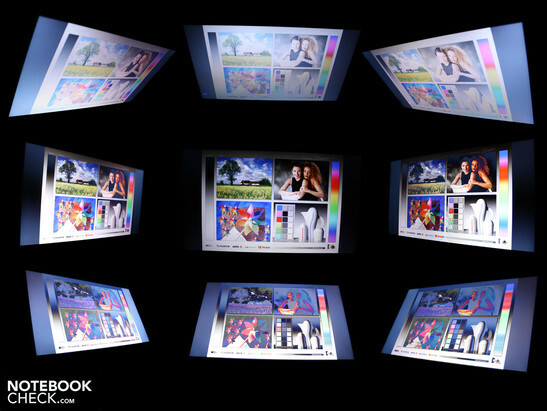 The glare type display improves the color reproduction a bit visibly, but the result remains unchanged. Colors aren't as high in contrast and brilliant, black isn't as deep black as it should be. The office fan will want a matt display because of the reflections. The screen isn't suitable for professionals because of the narrow color spectrum to begin with. An extended color space is out of reach. 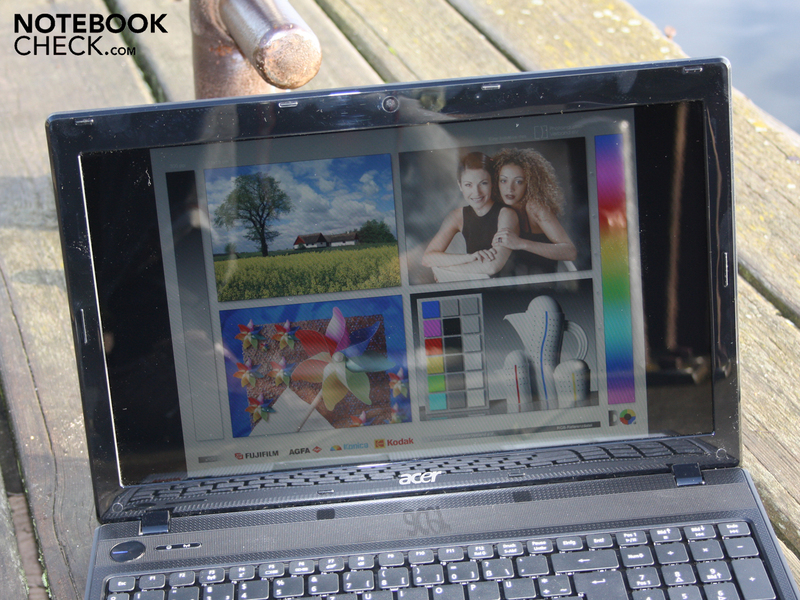 We have compared the screen with AdobeRGB (t) and the professional RGB-LED of Dell's Studio XPS 16 (t). The display distributes the brightness evenly over the screen (87%) This means, the LED backlight's deviations are acceptable. There aren't any spots visible on the homogeneous surface. Overall, the luminosity with an average of 183 cd/m2 is low. The 5552G's display isn't suitable for outdoor use. The very low luminosity is sufficient for the office, but fails in the sun. The desktop is simply too dark. There are also annoying reflections because of the glare type TFT. We can deviate up to 40 degrees from the front on the horizontal plane. After this the display dims and colors falsify. This effect already starts with the slightest deviation of 15 degrees on the vertical plane. The image darkens visibly and the colors invert. We experience the most major restrictions in a lateral view from above or below. When several people watch a movie or look at pictures, the one or other will have difficulties seeing a good image. 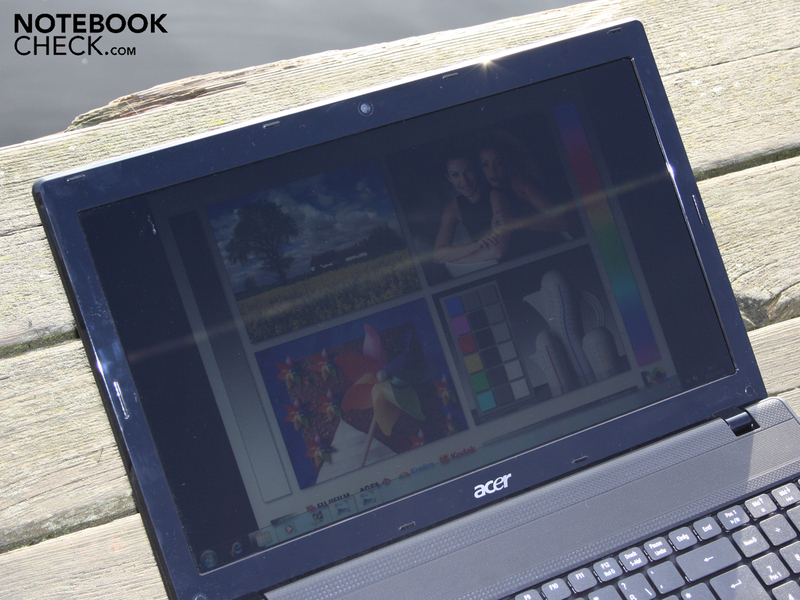 Acer equips its 15.6 incher with the AMD dual core, Athlon II P340 (2 x 2.2 GHz). The CPU only has a cache of 1024 KB. The processor, with a TDP of 25 watts, is on the AMD chipset and is supported by a 4096 MB RAM. The dual channel memory controller (DDR3-1066) is incorporated in the processor. According to GPU-Z, the ATI Radeon HD 5470 has an own 512 MB GDDR3 memory. However, the manufacturer's common practice would indicate a DDR3 video memory (higher price of GDDR3). The DirectX 11 capable GPU supports the processor with a video decoder (UVD 2) in HD videos (MPEG-2, H.264, VC-1). Additionally, there is ATI Stream, OpenCL and DirectCompute 11 (shaders take over calculations, e.g. PowerDirector). The GPU power consumption is between 12 and 15 watts. We've compared the Athlon II P340 (2.2 GHz) with Intel's current i3 processors, which can be found in the same price range, in the processor benchmarks. Cinebench R10's multi core test (64bit: 3928 points) shows the P340 as significantly inferior to the Core i3-330M (circa 6500 points). Even the older Core 2 Duo T660 (4948 points) and the triple core AMD Phenom II N830 (6021) process a lot faster. Although the i3-330M only has 2 x 2.16 GHz, it can compute with four threads due to Hyperthreading (HT). HT isn't of any help in Cinebench R10's single core calculations and thus the processors are closer. But Intel still has the lead. The P340 reaches 2071 points; the i3-330M achieves 1932 to 2931 points (23 test devices). The synthetic example calculations don't advocate the Athlon II P340. What does the application performance say about that? We use PCMark Vantage, a test that checks all components of the computer, including the DDR3-RAM, the hard disk and the HD 5470. The efforts result in 3188 points. 330M systems have always proved to be faster, no matter in which configuration. 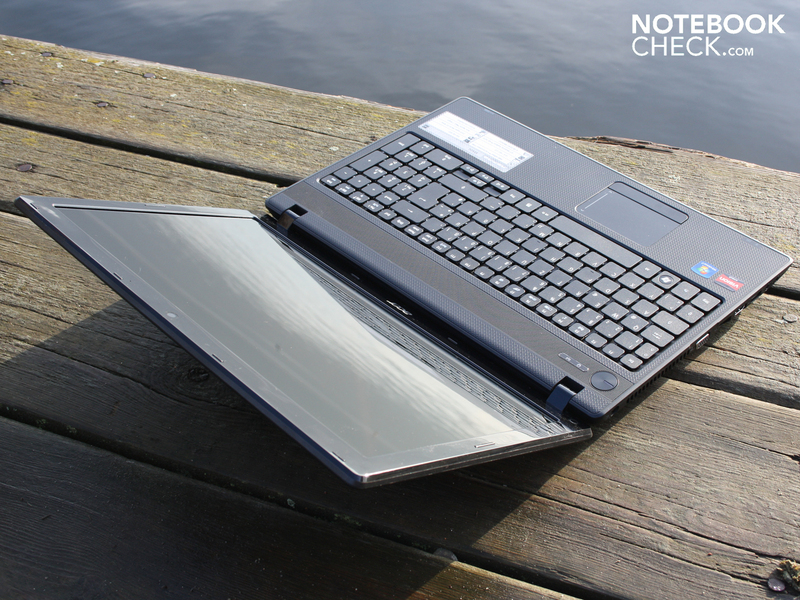 Toshiba's Satellite A660-151 (GeForce GT 330M; 5052 points) looks particularly good. Samsung's P530 Pro (Intel HD; 4000 points) suffers under its slow hard disk (both i3-330M). If you want performance, you should prefer a Core i3. However, if you have to decide among an AMD P340 and an Intel Pentium (T4200, T4100; are still sold), you should opt for the AMD. All four Pentium T4200 systems in our data base are defeated by the 5552G with the AMD P340. 2730 to 3004 points (HP Pavilion dv6-1211sg, Lenovo G550). The experienced application performance is fast and there is no reason for wavering. When many applications are executed simultaneously, the processing speed deteriorates noticeably. A Hitachi 5400 rpm hard disk (HTS545050B9A300) is installed in the 5552G. The 500 GB HDD reads data from the rotating disks with 58.1 MB/s in sequential read. 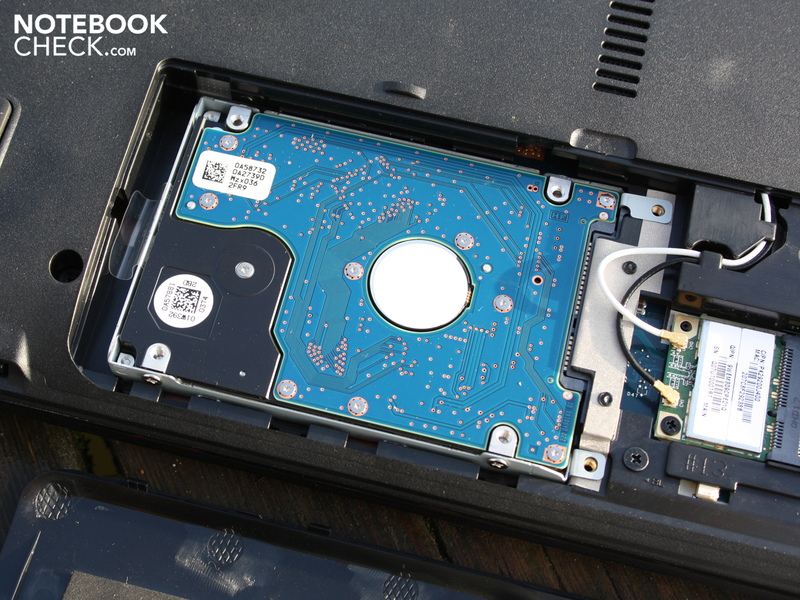 The test device only receives a below average HDD score in PCMark Vantage due to this (2629 points). 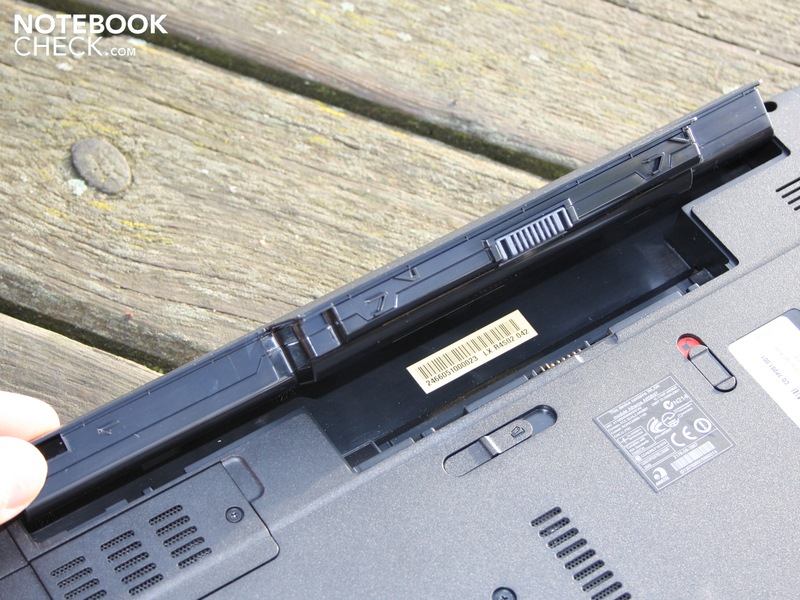 The 5552G has no ambitions to become a real gaming notebook. Nevertheless, we would like to deal with the ATI Mobility Radeon HD 5470's limited capabilities. The entry level midrange GPU's memory clocks with 800 MHz, the core with 750 MHz. Although the core clocks a bit faster than in a HD 5650, there are only 80 MADD cores available instead of 400. Thus, we determined a very poor 2903 points in 3DMark06. Not a good omen for current games. We've executed two gaming tests. The real-time strategy game needs strong GPU support and a fast multi core processor. But both aren't available in the Aspire 5552G. Thus, medium details are unplayable (17 fps). Merely the lowest detail level ran smoothly in a disagreeable 1024x768 pixels. Since the football fun only has low hardware requirements, it's very suitable for weak graphic solutions, like the HD 5470. Thus, even high details are smoothly playable in the native resolution (1366x768). That's a lifesaver for casual gamers. Both gaming tests prove that you have to forgo on current games that have high requirements with the ATI HD 5470. Previous tests with the HD 5470 also classify Mafia 2, Metro 2033, Battlefield: Bad Company 2, Modern Warfare 2 or Risen as unplayable (medium & high details). Current and especially demanding games shouldn't be on the wish list. The performance is nevertheless sufficient for older and less demanding games, the like of Left4Dead (2008) in high settings. 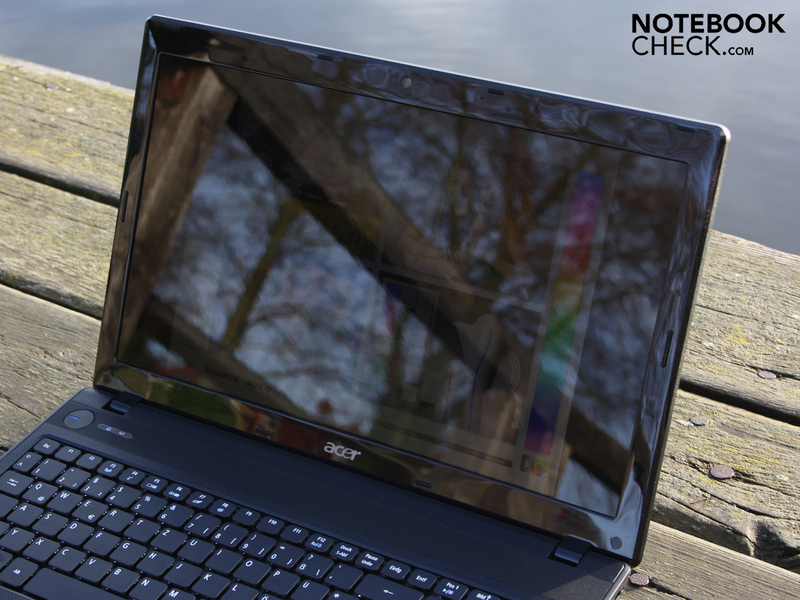 Acer's 15.6 incher shows itself from a pleasant side in terms of system noise. The fan runs with a low speed while surfing, listening to music or typing. But it never shuts itself off completely. We measure 30.9 dB(A) in idle. The fans rotation speed doesn't fluctuate during this. The hard disk is only slightly audible during activity in this state. 31.3 dB(A). The cooling system remained calm in both of our test games: 32.7 dB(A). The fan only turns up to a maximum of 35.7 dB(A) in the usual stress test (Furmark & Prime) where the CPU has to compute to its full. The fan rotates constantly here, too. Overall, the fan management makes a good impression. 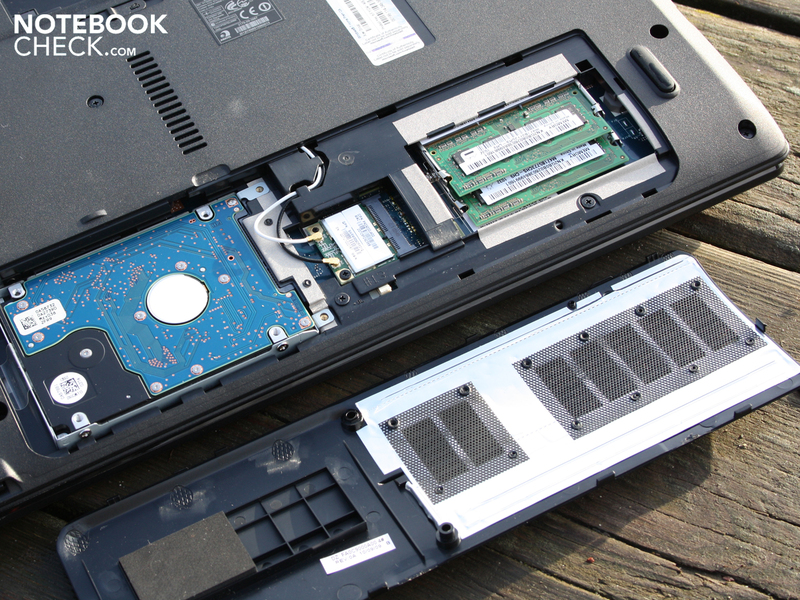 The Aspire 5552G is only audible when CPU and GPU have to process at the same time. Many users won't even notice the fan in undemanding office use. The bottom's average temperature merely reaches 32 degrees during a scenario of word processing and web surfing. The wrist-rest only heats up to 30 degrees. The temperatures stay low and only reach the 38 degree mark selectively during the artificial stress test. This provides for warm fingers. We measure 38.5 degrees from the keyboard's center. 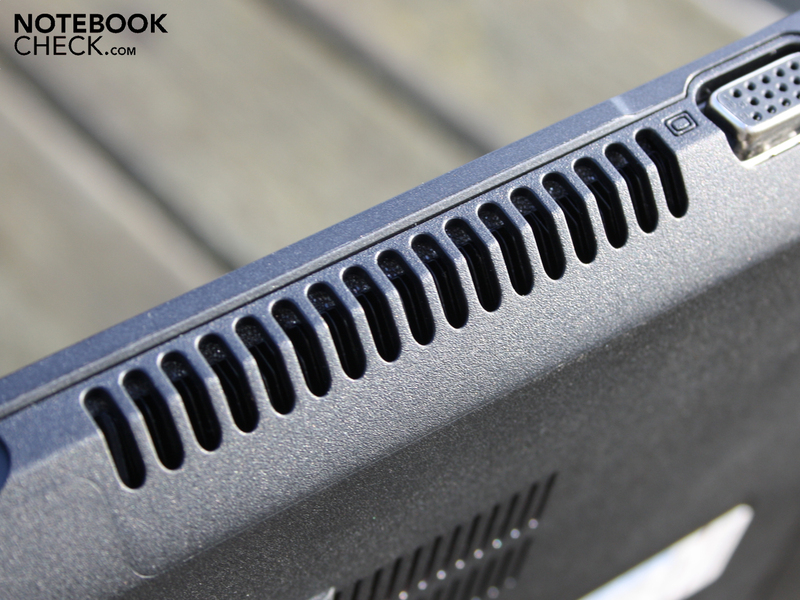 Inside, it doesn't look hazardous at all: CPU and GPU heat up to a maximum of 70 degrees. (+) The maximum temperature on the upper side is 38.5 °C / 101 F, compared to the average of 36.5 °C / 98 F, ranging from 21.1 to 71 °C for the class Multimedia. 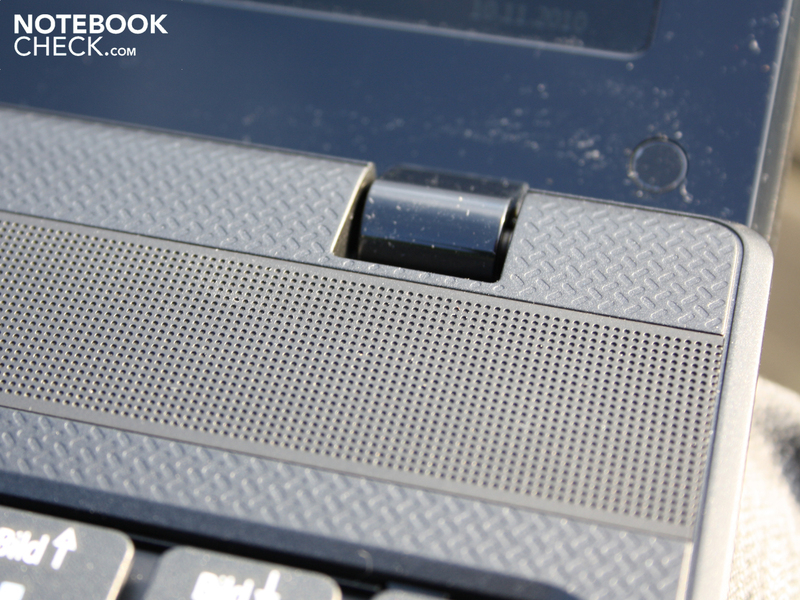 The stereo speakers are located above the keyboard under a perforated black grid. 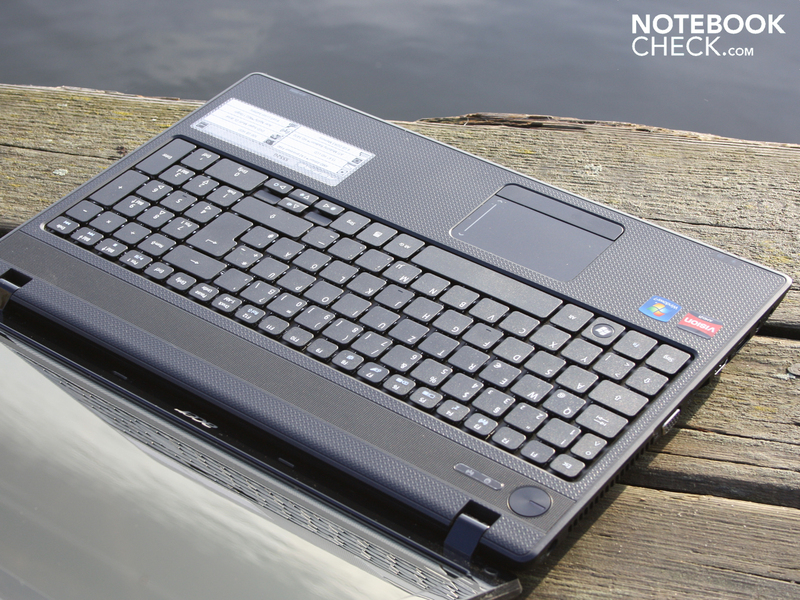 The test device doesn't meet the sound expectations on a multimedia notebook. The sound emphasizes the midranges, whilst both high and deep pitches are neglected. The installed speaker's sound can hardly, if not at all, be improved by the sound enhancements (e.g. virtual surround). The volume is relatively high. However, it should be limited in the volume balance because scratching occurs at maximum level. Connecting external speakers to the 3.5 mm headphone out will be the option of choice. We test this with two Yamaha speakers (YST-M20SDP). The volume tethered to the notebook hardly emits an audible static noise (audio test, no measurement). 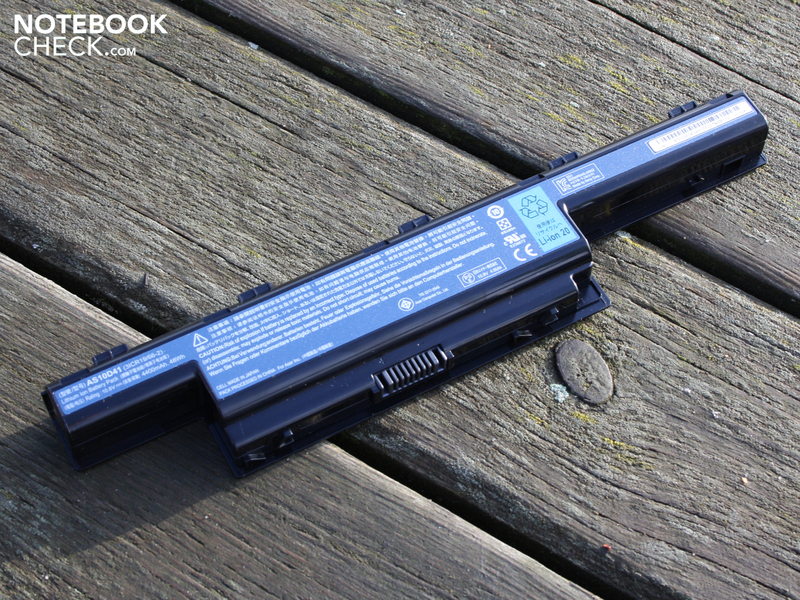 Netbooks have made the expectations on notebooks' battery life skyrocket. Thus, the Aspire 5552G won't get anywhere with its two and a half hours. The weak AMD P340 that is nevertheless engrossed by a TDP of 25 watts takes its toll. 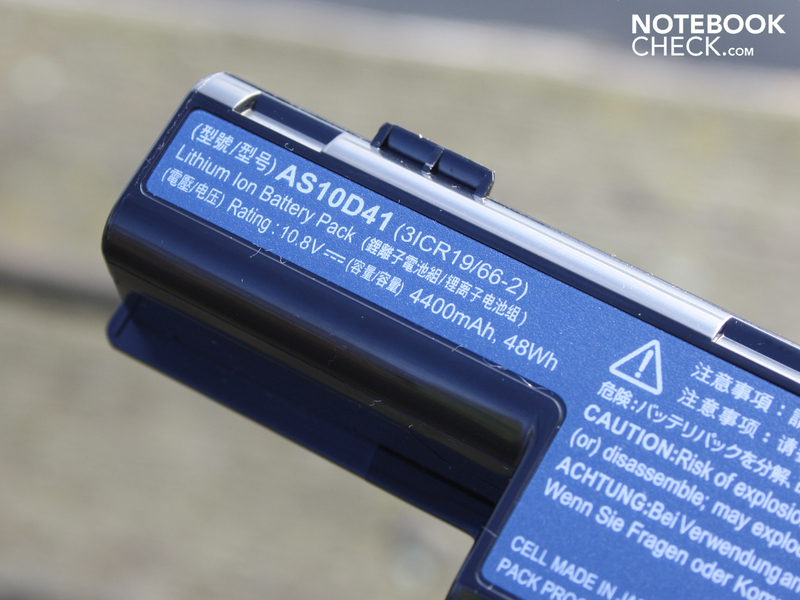 Moreover, there is the relatively weak 48 Wh battery. The battery life for internet surfing with enabled WLAN is 2:34 hours (154 minutes). We visited news portals and downloaded a few things in this time. Undemanding users can push the battery life up to 2:59 hours. These 179 minutes, determined with BatteryEater's Reader's test, are of no importance for routine use (idle, lowest brightness, disabled wireless modules). The DVD movie battery life test determined 119 minutes (1:59 hours). The 4400 mAh battery is ready for the next movie session after 1:31 hours (92 minutes, recharging). When all energy savings options are exhausted and the brightness is dimmed to the lowest level, the idle power consumption is 12.6 watts. An average of 24.6 watts is realistic, though. This is the maximum power consumption that the 15.6 incher treats itself to. So, the Aspire 5552G isn't exactly economical. 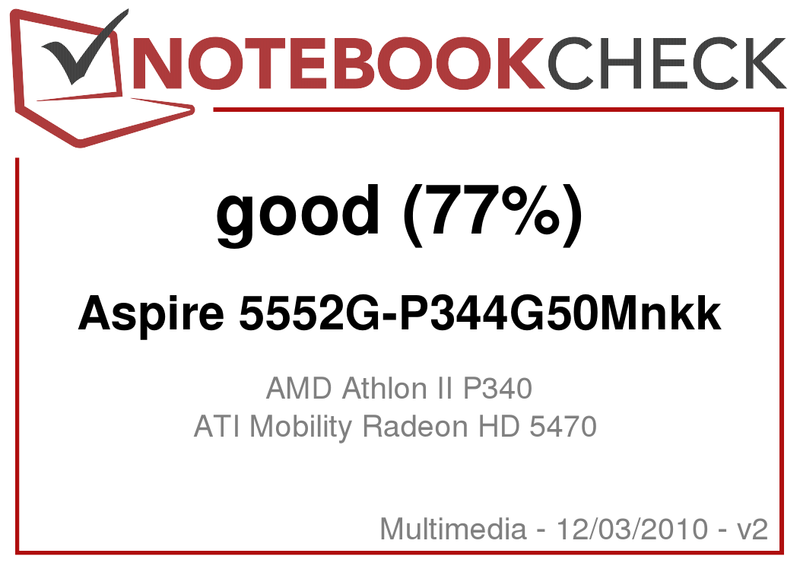 The Aspire 5741G-334G50Mn (i3-330M, HD 5470) only consumes 10.5 watts, the Lenovo Thinkpad L512 (i3-330M, Intel HD) is satisfied with 9.2 watts (all minimum power consumption). However, the 5552G is on a low level for a notebook with a graphics card that can't be disabled. When the HD 5470 is active during a 3DMark2006, the total effective power increases to 54.4 watts. We assess the maximum requirement in a stress test of Prime95 and Furmark. The multimeter now indicates 61.1 watts. The 90 watt adapter seems to be suitably sized. Battery recharging needs about 20 watts. 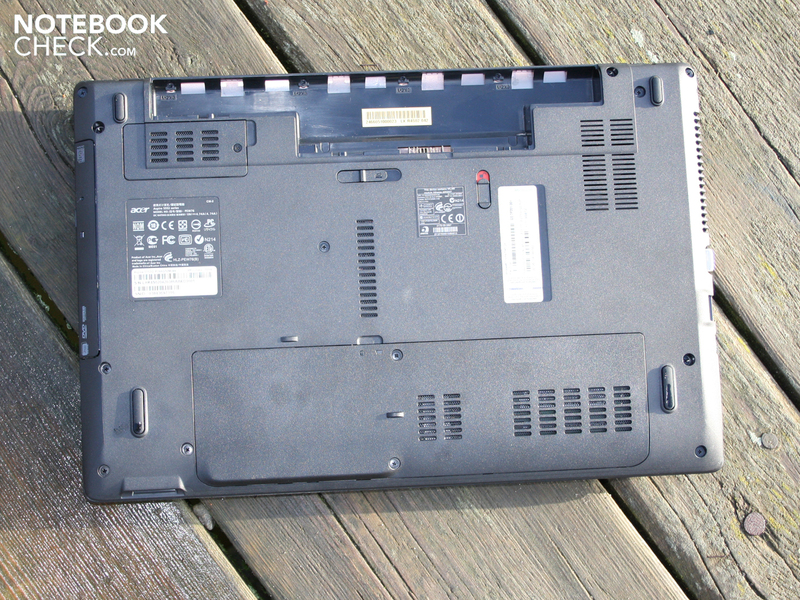 The Acer Aspire 5552G-P344G50Mnkk with an Athlon II P340 (2x 2.20 GHz) is an all-rounder that has low, but in most cases, sufficient office performance data. The entry level GPU, ATI Mobility Radeon HD 5470 can only reproduce current 3D games in extremely reduced details and resolutions. Serious gamers should better look around for an HD 5650 or Nvidia GT 330M/425M. The Aspire's advantages score with a sufficiently stable, but especially with a resistant, case. 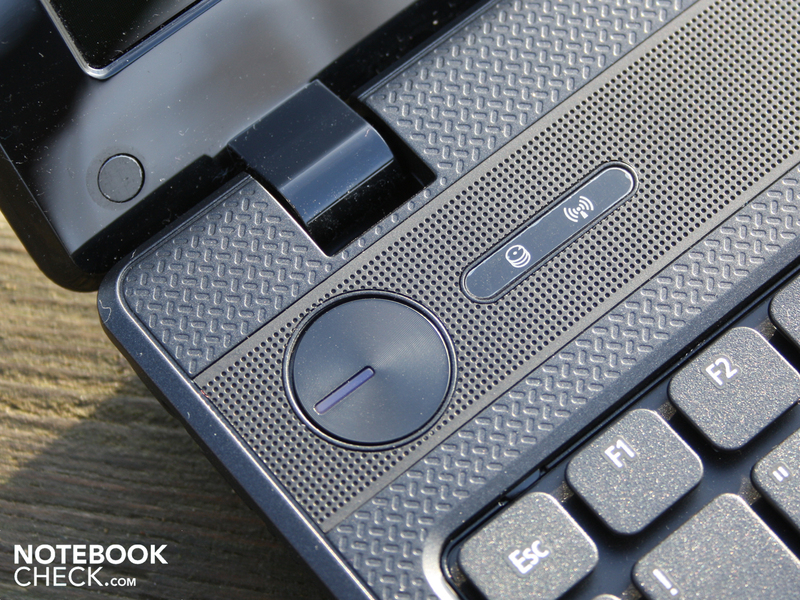 The ergonomic key data is good (temperature, system noise) and the touchpad is compliant. The 15.6 incher remains quiet, or just audible, at every time. Unfortunately, the keyboard fails in every average typing demand because it yields and thus gives a spongy feel. In return, the layout including a number pad is successful. The 15.6 incher's battery life doesn't meet the expectations. Two and a half hours of WLAN surfing or two hours of DVD playback isn't great. It also has a reflective and too dark display that makes working in sunlight difficult. 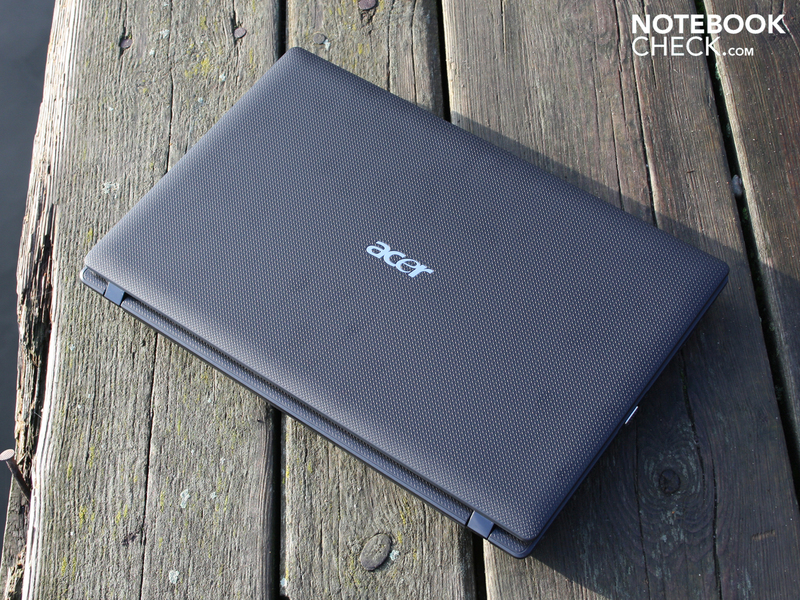 If you aren't dependent on gaming performance and high mobility, you'll get a fair offer in the Aspire 5552G. The 15.6 incher is available for a bit less than 600 euro. Alternatives with stronger graphics cards (HD 5650) and quad/triple core CPUs (Phenom II X4 N930, X3 N830) can also be found on virtual shelves. and the DDR3 RAM (two bases) can be removed. This small bay doesn't have a base. The length would indicate a full size mini PCIe. 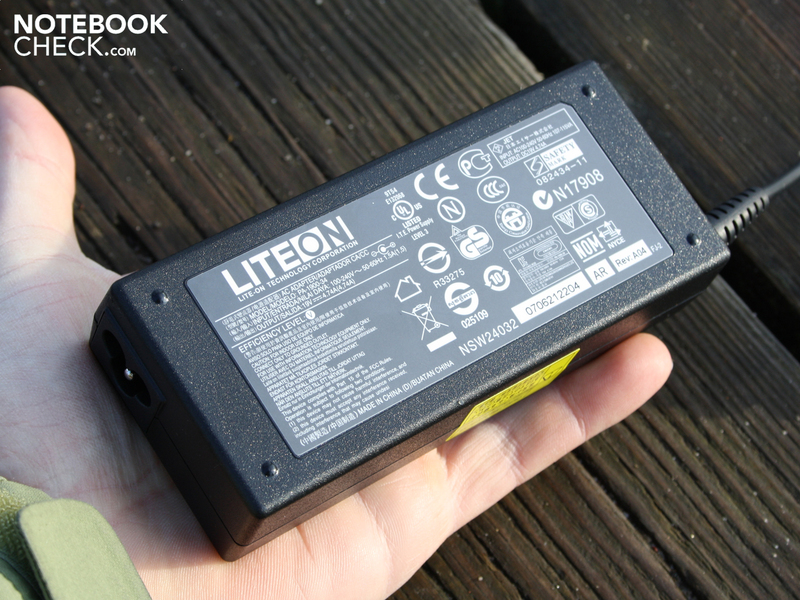 The elongated battery keeps the 15.6 incher going for 2:00 to 2:30 hours. 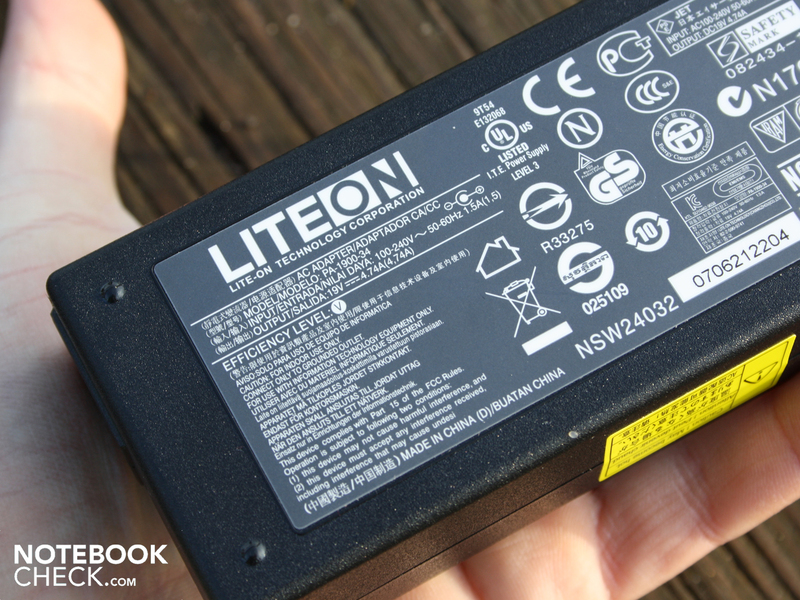 It has a capacity of 48 Wh (4400 mAh). The battery is rolled out and thus has a secure fit. The 90 watt seems oversized (368 grams). No DVDs, only this quick start guide and warranty card are part of the supplies. 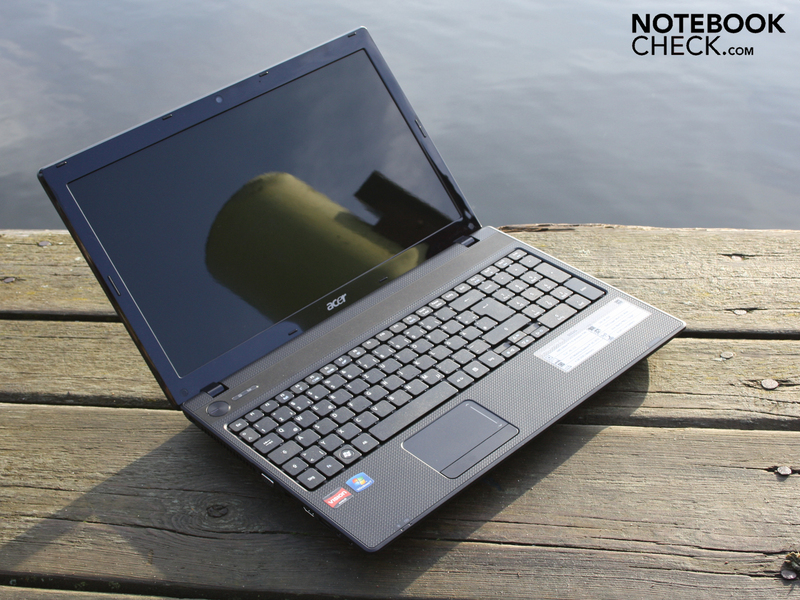 Acer 5552G-P344G50Mnkk: AMD driven all-rounder with an ATI HD 5470. Acer 5552G-P344G50Mnkk: The plain and non-slip plastic appeals to the office user. all upgradeable components can be found. introduces itself as a resistant all-rounder. 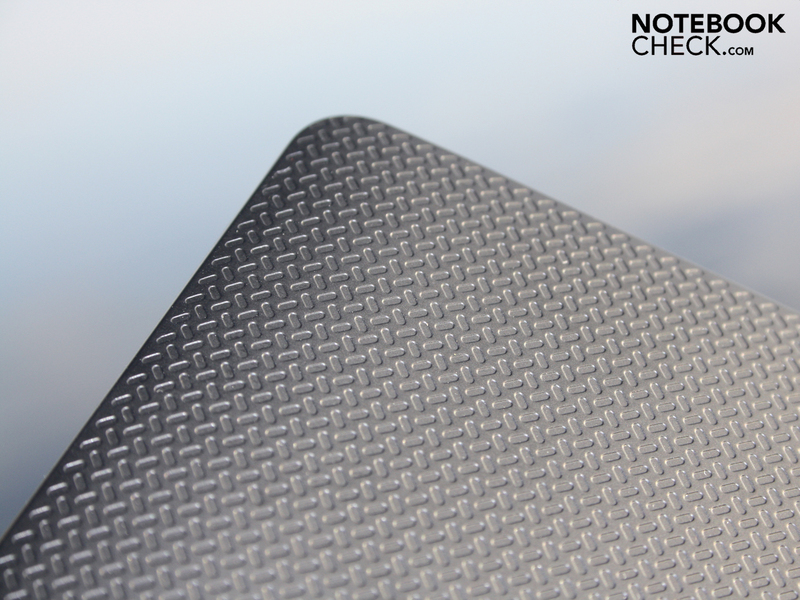 are resistant against scratches and fingerprints. 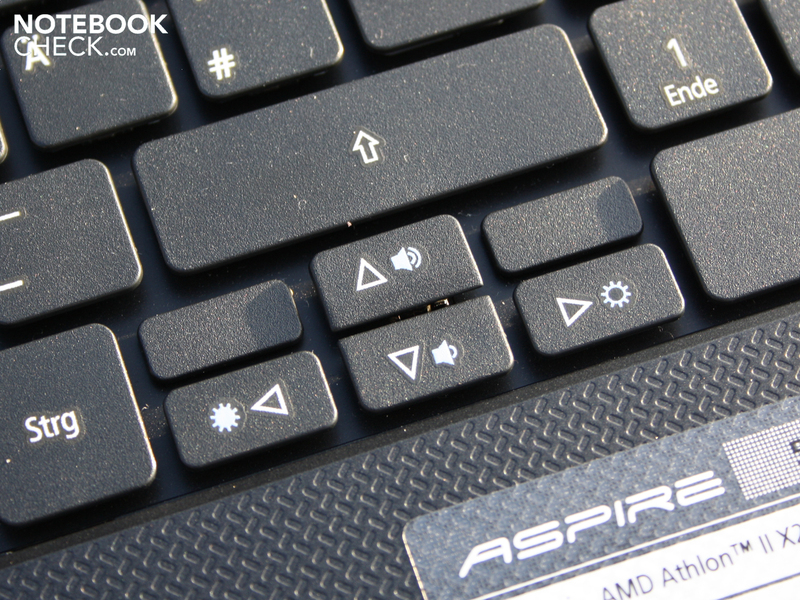 The separated arrow keys support typing. The most sensitive area is the reflective display. The hardware is just right for starters: Office computing power with Athlon II P340 and a bit of gaming with ATI's HD 5470. The connectivity turns out modest. No USB 3.0, no eSATA and no ExpressCard either (picture: cardreader). The base plate can be dented here and there, but is basically solid. 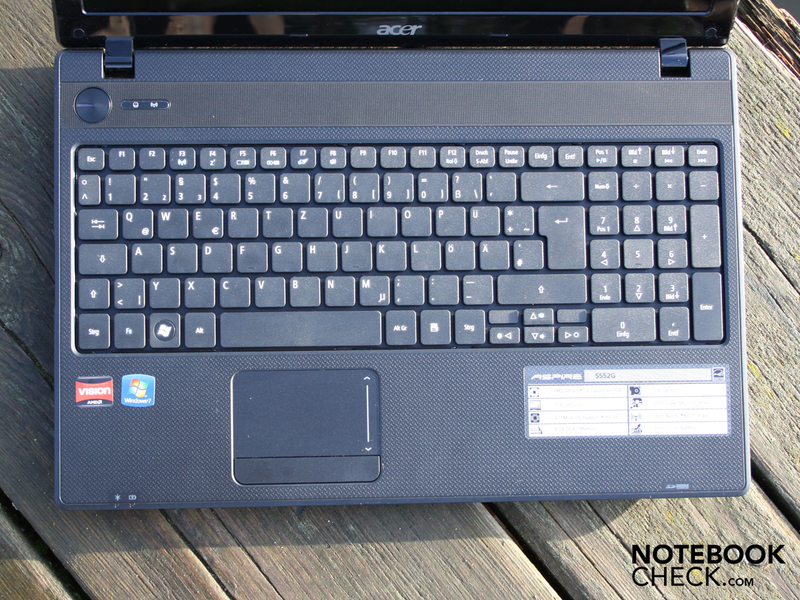 Acer 5552G-P344G50Mnkk: The yielding keys aren't really any fun, though. Resistant, but also conservative plastic surfaces that don't inevitably look "cheap". A matt display would have made the 15.6 incher to a good office laptop. The courage to use a plastic look without aluminum or aluminum imitation. All-rounders under 700 euro: Acer Aspire 5741G: Radeon 5470; Aspire 5551G: AMD X3 triple core; Lenovo IdeaPad Z565-4311: high-end looks; MSI CX620MX: interfaces on the rear.